The miners of the California Gold Rush didn’t need law and order, toothpaste or running water. They needed a course in money management. In a bit of nicely rendered irony, Dolnick (The Clockwork Universe: Isaac Newton, the Royal Society, and the Birth of the Modern World, 2011, etc.) closes this spirited account of the Gold Rush with a fiscal reckoning: The average miner earned a whopping $20 per day—no small sum—at the start of the rush in 1848, but only $6 per day toward the end in 1852. What they made went through their fingers like water, but, writes the author, they found treasure of another kind in the freedom they enjoyed: “They had woken every morning in a shabby tent or a crude cabin and dreamed that they would fall asleep that night as rich as Croesus.” The sentiment is a touch purple, given the damage the rush wrought on the landscapes of California and the people who lived among them. 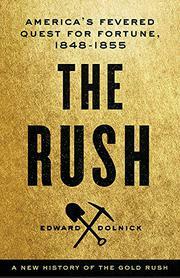 Nonetheless, Dolnick does a good job of locating the sentimental core of the rush and placing it in the context of its time—just a few years, he notes, after the word “millionaire” had been coined to describe the “exotic creatures,” no more than a dozen or so, who boasted the greatest wealth the country had ever seen. The mere existence of the word was enough to set dreamers’ hearts to fluttering about becoming one of that dozen in the faraway fields of equally exotic California, a “half-unreal locale like China or Egypt.” Dolnick draws on the best historiography and writes winningly of the events in question, augmenting but not supplanting the many books that have come before this one. Readers new to Gold Rush history will find a bonanza here—and for old hands, Dolnick provides enough fresh interpretation to keep the pages turning.